Ain’t you ‘shamed, you sleepy head? We’re riding in the back seat of the car. Emma is in her car seat and I am strapped into my seat belt. Mommy and Muzzie sit in the front seats. It takes a long time to go anywhere in Atlanta, so Emma is accustomed to riding. While we ride, I reach into my memory for the poems and songs my mother taught me. 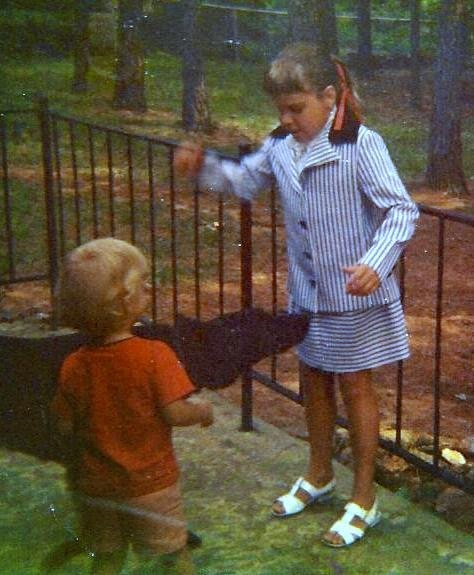 When I finish saying the ‘birdie’ poem with all the gestures I learned as a child, she says with a special smile that I’m sure she smiles only for me, “Say one more time.” So I say it again and again until she has learned it, and we can say it together. Before we get to the restaurant, we have time to sing "Yowee Eyes." The Owl has two big eyes, like this! He sits and sleeps all day like this! He has the mumps like this! Arms flapping there's a wave of giggling! We are owls. On the way home from the restaurant it is dark, so we sing the moon song. Somehow it seems that whenever we ride at night in Atlanta, we can see a large moon from our car windows. I think it shines just for us. “I see the moon. The moon sees me. The moon sees somebody I can’t see. “This is the church and this is the steeple. Emma says, “Say one more time?” and I always say the verse at least once more. Sometimes she comes to stay with us for a day or two. She will be four years old soon, and she has been spending an occasional weekend with us since she was very little. She does chores with Grandpa when she is here, riding her special truck through the back yard to feed the dog, the birds, and the squirrels. Then they sit in the swing and talk. He calls her ‘Bird’ or ‘Little Darlin’’, except for when she calls him ‘Creepy Dragon’ and he calls her ‘Creepy Alligator’. He doesn’t care that she has two mommies. In our house, at the far end of the hall, back in a corner, there is an old walnut pie safe. Before she was born, I planned to use it as a place for her toys; but the toys are all elsewhere, in closets or drawers or tucked away in special places all over the house. She has some outdoor toys in a big basket in the basement and her tricycle and wagon are on the carport. We buy most of her toys and books at garage sales, fighting over them with all the other grandmas and grandpas. Before Emma had the patience to listen to long stories in books with few pictures, I would tell her the stories rather than read them. Her favorite was the story of The Little Tin Soldier. On the cover of this book of stories is a picture of a little tin soldier who has only one leg and a ballerina who stands on one leg, her arms in the air and her foot raised, a still moment mid-pirouette. They pose there, side by side, among the rest of the book’s characters. 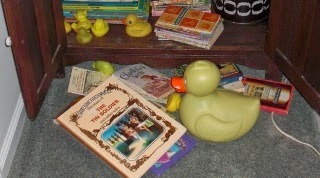 Even though Emma is now patient enough to hear me read it from the book, she still likes for me to tell her this story. A little boy has lots of toys, but he likes most his tin soldiers. Each day he lines them up to to play war, and stands the little soldier with only one leg on the window sill as a sentinel. The little soldier looks longingly at the toy ballerina because she is so beautiful, but he is too shy to talk to her. He thinks she could not love someone with only one leg. After all, even though she stands on one leg; she has two legs and she is a beautiful dancer. One day the little soldier fell off the window sill into the street where some mean boys found him and put him in a paper boat, laughing at the one-legged sailor they have made. He sails down the rain-filled gutter into the river and then into the ocean where a storm turns his boat over. As he is sinking into the sea, he is very sad, because he will never see the ballerina again. Then a large fish swallows him and the fish is immediately caught in the net of a fisherman. The fisherman takes the big fish to market, where the cook buys it to bake for dinner in the very house of the little boy who once owned the tin soldier. The cook finds the soldier in the belly of the fish, and the little boy is so glad to have his toy again that he puts him safely on the mantel above the fireplace, where the ballerina already stands. Side by side, they stand for days, too shy to talk, and then a sudden gust of wind causes the ballerina to fall off the mantel into the fireplace where she begins to melt in the heat. The brave little soldier rocks himself back and forth on his one leg until he falls into the fire, intending to save the friend that he loves, the ballerina. Of course, he begins to melt, but just then the little boy comes along. Seeing them in the fire, he moves them away from the flames with his foot. When they are cool again, he puts them back on the mantel together, because while they were in the fire, the base of the little soldier and the base of the ballerina melted together into the shape of a heart. They stand together now, forever joined by their love, and they lived happily ever after. 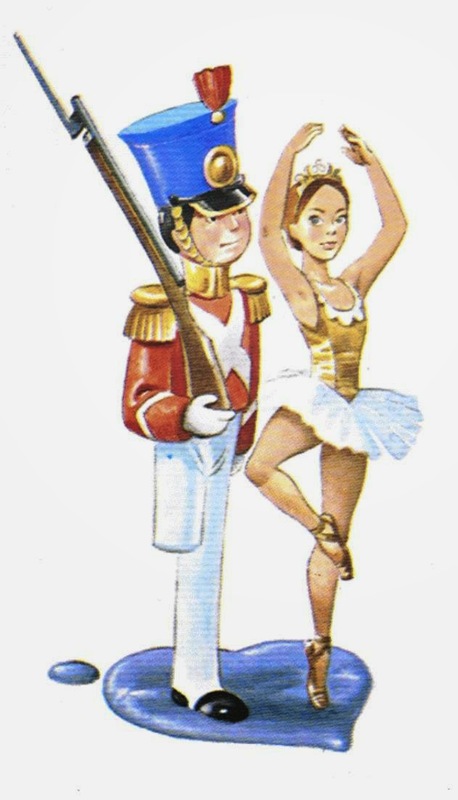 On the last page of the story is a picture of the little tin soldier and the ballerina standing together on their heart-shaped base. Emma always rubs her fingers over that picture while I am telling her the end of the story. After I finish the story, Emma and I make up things that the ballerina might have been doing while the soldier was off in another land. She is sure the ballerina was in school every day and going to dancing lessons on Saturdays. Emma is going off to college this fall. She doesn't have much time to read for fun now, but she'll be back to the bookshelf soon. 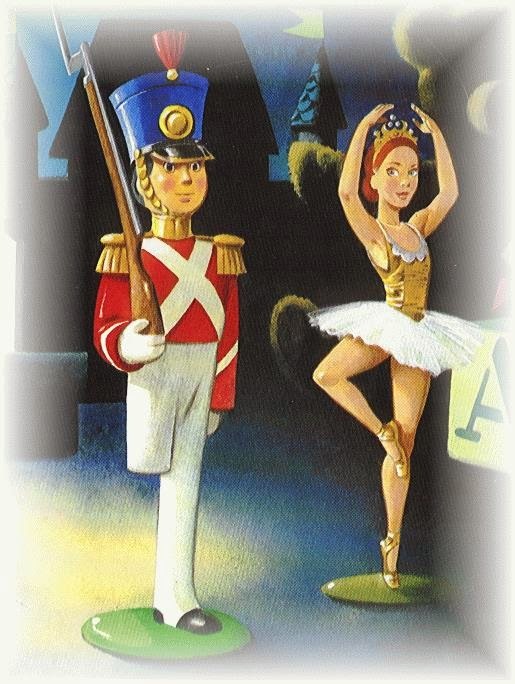 The original story by Hans Christian Andersen can be found HERE as The Steadfast Tin Soldier. What beautiful memories and described in such a wonderful, loving, touching, intimate way. I love the way you write and I love you! Thank you, Kim. It's not hard to write about love. You're learning about the 'g' kind of love now, and you know it's special. Because I don't know the system, I lost the whole paragraph about reading to our little 5-year-old Korean whom we fostered for two years before adopting him. He spoke no English when we got him in October, but after reading to him every night, by late November he was quite adequate and he and I communicated well. I would give him a good night kiss and hug and say "Good night my sweet prince." One memorable evening I did my usual, and as I was closing his door I heard his little voice say "Good night my lovely man"! So now, this is 'Anonymous' (from Gene Schwanke). Michael starts college this fall. Tell me more about reading to Michael, Anonymous. You can write it again. I'm patient.